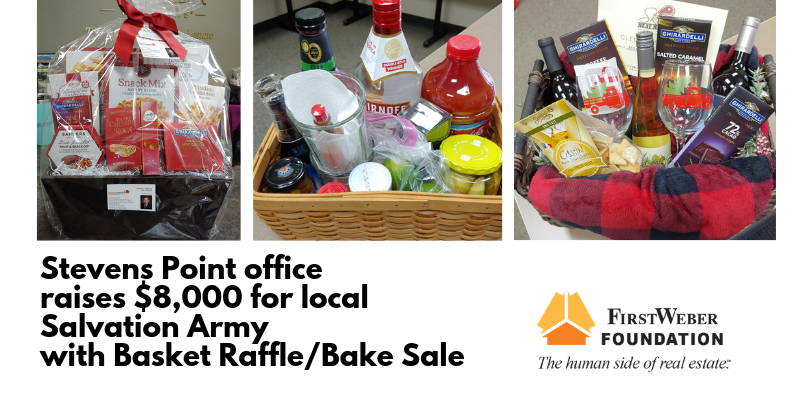 The Stevens Point office held a Basket Raffle/Bake Sale to benefit the Salvation Army of Stevens Point. With matching funds from the First Weber Foundation, they were able to donate $8,000! Agents, local businesses and individuals donated baked good and raffle baskets – everything from spa treatments, a Bloody Mary basket, tool set, lock set, coffee basket, wine and Margaritas from a local Mexican restaurant. The event would not be such a success without the local support of businesses and bidders. We thank you all very much! Over the last 5 years of holding this fundraiser, the office has been able to donate $32,500 to the Salvation Army of Stevens Point.